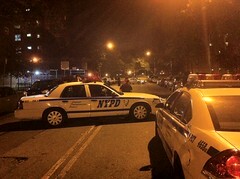 The spike comes amid recent high-profile incidents in the neighborhood, including the first homicide of the year, as well as a stabbing in East River Park. The police are still investigating yesterday’s early-morning shooting at the Jacob Riis Houses, and have yet to name a suspect. A police spokesperson revealed today that the victim was a 39-year-old woman. According to the police, the gunman, who was on a bicycle, was having a dispute with another man and fired on a crowd at 903 East Sixth Street, injuring the woman who is not thought to have been his intended target. Check The Local later for a report from tonight’s meeting, which begins at 7 p.m. in the Ninth Precinct stationhouse at 321 East Fifth Street. Previous post Tenants Say Landlord Has Lost It, But What Can They Do?